What if I told you Square Enix and Tik games were coming out with a game based on the celebrated and psychedelic characters of Nathan Jurevicious next week? What if I told you I've played it and it was a ton of fun? What if I told you it reminded me of one of my favorite PS1 platformers of all time? Would you be as curious as I am as to why nobody has been talking about this game? Of course you possibly might! Scarygirl is the story of a little girl who is not quite sure who or where she is. Abandoned and washed up on mysterious peninsula, she searches for the man who haunts her dreams. She's been raised by an octopus and trained by a bunny who is also a kung fu guru. She now lives in a treehouse. Don't ask. The world of Scarygirl is filled with odd and interesting characters such as these that have all been ripped straight from the stories and upcoming graphic novels which they populate. The game's art style mirrors this and is wonderful to behold because of it. The game is comprised of seven worlds with three levels each which Tik says adds up to about 6-8 hours of gameplay. Pretty standard for a downloadable platformer. 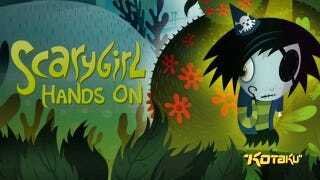 However, what sets Scarygirl apart from other quirky platformers is the combat. This girl's got some moves. Quite a lot in fact. We're talking light attacks, heavy attacks, slams, grabs, combos, juggles and grapples. If this little girl had any deeper of a moveset I'd need to call in Capcom's Seth Killian to help me figure it out. Luckily, along the way you'll run into your Bunniguru who will help you learn your new moves as you acquire them. I can't stress how much I enjoy games with fun and easy to use tutorials. The build I played had all of Scarygirl's moves already unlocked, but you'll have to learn her abilities the old fashioned way by collecting gems and unlocking them as you progress through the game. Using her tentacle arm, (did I mention she had a tentacle arm?) you can not only give your cartoony foes whiplash, but also swing from platforms and hover in midair for a short period of time. If she gets mad enough, Scarygirl can also go into "scarymode." While active, scarymode more or less turns Scarygirl into a wrecking ball of death and destruction. Good times. Scary good times. Anyhow, earlier I mentioned that Scarygirl reminds me of one of my favorite PS1 platformers, and indeed it does. That game is Tomba!. Do you remember Tomba? Well you should, because it was bloody marvelous. Much like Scarygirl it was a 2D platformer with 3D camera elements that involved a whole lot of jumping, smashing and throwing of enemies. It also took place in a world that was equally as strange, and for some reason filled with a whole lot of pigs. I suppose it's hard to explain how one game can simply "feel" like another. Yet considering I don't think I've ever compared any game to Tomba! before, Scarygirl clearly must have triggered something from deep within my repressed teenage gaming memories. In fact, there's a good chance I'll be popping Tomba! into my PS3 this week... if I can find it. So lets recap. Creepy little girl with tentacle arm + cool art style + sweet combat and platforming + fond PS1 memories = game that comes out on XBLA and PSN for $15 next week. You dig? If so, let's get some people talking about this, shall we? Seriously, I'm still mad at the internet for not telling me about Bastion sooner. Rawr. Oh, and for those of you asking - Yes, Scarygirl is coming to PC later this year.